Mac running out of disk space? Maybe you don’t have room for installing a new app, backing up a device, copying some files, or much of anything? If you’re running low on disk space or have ever received that dreaded “disk full” message when using a Mac, you know it can be pretty frustrating to try and free up storage space quickly so you can get back to work. 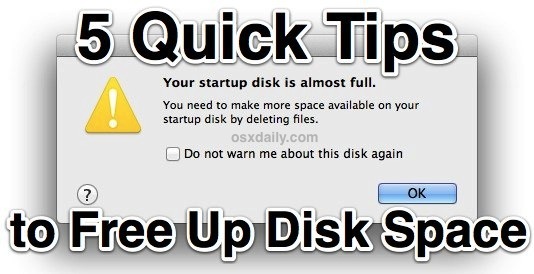 But it’s actually not too hard, and there are a few quick and easy tips to quickly free up space on a Mac so you can get back to work in no time, and begone with the “Your startup disk is almost full. You need to make more space available on your startup disk by deleting files.” error. Apps like Safari, Chrome, Firefox, Photoshop, Spotify, and many others, create temporary cache files while they’re in use. If you haven’t quit these apps in a long time, those cache files continue to grow, and generally they aren’t cleared out until the app is quit. You can also delete the cache files manually, but it’s much easier to just relaunch your apps and have the OS clear it for you. It’s a good idea to relaunch apps from time to time for this reason, particularly web browsers. The user downloads folder is notorious for growing gigantic when left unchecked for a while, and it’s often the easiest pickings. Jump to your ~/Downloads directory and sort by file size, then delete anything (everything) you don’t need any more. A good future habit to help manage the downloads directory is this: once you install an app, delete the installer .DMG file, zip file, or archive it came from. Though we rarely reboot our Macs around here, rebooting a Mac will almost always free up a fair amount of disk space, simply because it flushes system caches, some app caches, installs system updates, and perhaps more significantly, the virtual memory swap files and sleep image files. 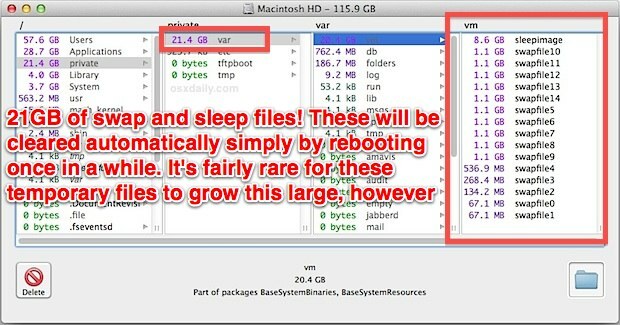 The latter two can grow quite large if you rarely reboot a Mac. Swap files are basically things that are no longer active in memory and then swapped to storage on disk, and the sleepimage file is basically a duplication of what’s in current memory so it can be retrieved when a Mac is woken from sleep. Both of these files will be cleared when a Mac is rebooted, in the example below these two temporary files accounted for 21GB of disk space alone, though this was on a Mac that hadn’t been rebooted in five months. It’s a good idea to reboot a Mac with some regularity, even if it’s only once a month or so to install the OS X system updates that come out periodically. Speaking of System Updates, if you’ve downloaded them but haven’t installed them yet, they’re just sitting around taking up disk space on your Mac. That can easily end up taking up a couple gigabytes for major system updates, and rebooting will take care of that wasted space and also install the update. OmniDiskSweeper is an excellent free utility that will scan your hard drive and list all directories by size, making it extremely easy to quickly determine what is taking up space and where. Use this to identify space hogs after you’ve targeted the easy suspects, like the downloads folder. This is generally better for advanced users, and you should never delete a file you’re uncertain of it’s purpose, and certainly never delete any system files or you may mess up the Mac. We’ve discussed the free OmniDiskSweeper tool in the past as a great way to recover disk space, and there’s no better time to use it then when you get the dreaded “disk full” warning. Sounds obvious, right? It is, but it’s also pretty easy to forget to empty the Trash and let it grow and grow, and sometimes a hard drive can be running out of space simply because a bunch of stuff was moved to the Trash but it wasn’t actually emptied. If you’ve somehow never done this before, right-click on the Trash and choose “Empty Trash”. The user Application Support folder is also worth checking, particularly if you have Steam installed and play games, or once played games. Steam keeps a lot of files in ~/Library/Application Support/Steam/ and if you have a lot of Steam games installed, they can grow quick. Once you stop playing a game, it might be worthwhile to clean up that folder. If you’re on a Mac with a smaller hard drive, it might even make sense to move the Steam folder onto another drive. Anytime you head under about 5-10% of your maximum drive capacity, you should start doing some housekeeping. Macs (and all computers in general) run best when there is adequate free space available for cache files and swap disk, so always aim to have some free space available. Another great way to free up disk space is to uninstall any Mac applications you no longer use. Generally, this is as easy as going to the /Applications/ folder and removing apps you just don’t need anymore, or you can even delete from Launchpad the apps that have come from the App Store, much like you do in iOS. If you want a more thorough approach to completely delete an app and anything related to it, free third party tools like AppCleaner are what you’re looking for. Have any good tips to free up disk space on a Mac? Let us know in the comments! OmniSweeper is one of my favorite tools. DaisyDisk is another nice one with a better interface. Don’t forget to look at the Music, Movies, and Pictures directory too, for the media hogs out there they grow larger than anything else. I found that even when using apps like App Delete it still does’nt get rid of everything, so what I have been doing is after the app is suppose to be deleted, I use Find Any File to look for remnants of the app id places where App Delete does’nt look. Don’t forget Monolingual, on a fresh install I have found it can easily clear up 2-3 GB of space. GrandPerspective: free app, gives a graphical representation of files, bigger files are physically bigger on the map. Makes it easy to track down large files that might be hogging disk space. Don’t know if it’s the same than OmniSweeper or things like that, but I use CCleaner from the AppStore to clean caches and stuff… it worked great so far (specially when Safari stops loading websites because of the disk cache and there’s no other way to load the site correctly). Another tip is to empty the iPhoto trash. When you delete a picture in iPhoto, it doesn’t actually delete it, but moves it to the iPhoto trash until you empty the iPhoto trash. You can easily have multiple gigs of photos in there, especially if you go through lots of video. 1. Check the size of your recovered mailboxes by going to ~/Library/Mail/Mailboxes/ AOL and GMail accounts are susceptible to storing messages over and over again if they are unsuccessful in sending. There are some tips on the web to stopping this issue including deleting the recovered mail folder in the mail app. 2. Check out Disk Inventory X to see a graphical representation of what’s on your hard drive. It takes about 5 minutes to scan the drive, but it is well worth it. This is a great place to start looking for massive files. Use „Clusters” by Latenitesoft . It uses Apple’s own file compression technology, transparently, completely in the background, takes little system resources, regains Gbytes of space. Use XSlimmer to get rid of unnecessary app architectures and languages. I reclaimed about 10GB the first time I used it. It makes Time Machine quicker too! If you use two disks – one SSD and one HDD – your trash will most likely be located on your SSD because it’s located on the system drive. My trash is usually quite large (10, 20, 30+ GB) which is quite a decent amount compared to the SSD size (128 GB). So I wanted to move the trash folder, which is located in /.Trashes/, to the HDD. Does anyone know how to do this safely? You can’t. When you trash a file, the file actually moved to an invisible folder on the same drive. From the Finder, they appear to all be in one big trash can, but in reality, the trashed files are actually located in an invisible folder on each drive–the one the file was on before you trashed it. Emptying the the trash then deletes all files from all drives. You can prove this to yourself by creating a large file on your HHD (say 10 GB). Then trash it. If the Mac had to move the file to your SSD, this operation would take some time to transfer to the other drive. Try it and you’ll see it’s instant. Because all the Mac is doing is moving the file on your HHD into an invisible trash folder on the same drive. That’s why it’s nearly instant. Also, notice that if you trash a file on removable drive (like a USB thumb drive) on one Mac, then eject the drive without emptying the trash, you can move the drive to another Mac, plug it in, and the trashed file will appear in the new Mac’s trash folder. You can actually see the osx trash folder on flash drives if you plug them into a windows or linux machine. This is kind of tangential but I had to laugh (and very much liked!) when I saw your ‘reboot once a month’ comment. I myself have long been in the ‘leave it on’ camp — but how do you persuade those who say ‘Save a tree, man. I love the Earth. If I won’t be using my computer for five minutes or more, I turn it off.’? I have had only limited success explaining thermodynamics to these people. Delete old IOS device backups. Can be done from iTunes preferences-Devices. Scored 30+GB of SSD space with this one. Also in iPhoto create a smart folder for all files with .mov file type then drag to external disc or, better still, to network attached storage. Then delete them from iPhoto. Another 30GB saved there. The iTunes media folder can also be relocated to the NAS as well. Hey, thanks the for the tips! My Steam folder was huge but when I ran OmniDiskSweeper I was astonished that I found a lot of other huge and useless folders. There was this “MobileSync” folder that iTunes uses as a backup directory for the iPhone. It was over 20GB and I really don’t need that. DELETED! For those who have it, it is also worth configuring iTunes not to backup anything automatically anymore. Or it will bring back that folder. Still can’t find that data. Try running it as a super user. Solved a 5hr mystery for me!